I have a long post about library instruction and teaching fifth graders to use Wikipedia, and I have an extremely long post about ALA, OCLC, and some other library initialisms I can’t recall at the moment, but for now I’d just like to make a quick post to complement Karin Dalziel’s opening salvo and Dorothea’s and Meredith’s subsequent blog posts. One of the skills I don’t have that I wish I did is that I am not a very fast reader, and I’m kind of a picky reader. That gives me a certain set back in a primary part of my job. The question I get asked more than any other is, “Hey, what’s a good book to read?” I haven’t usually read most of the books on our new books shelf. I’ve read only a sliver of the other 20,000 odd books we have in our collection. I can’t always answer that question with a personal recommendation, but luckily, I have some skills that help me out. I know how to say, “well, what are some other books you’ve liked?” I know how to figure out what kinds of things a particular reader is looking for in a book: fast pacing, say, or serial killers, or books about middle-aged women breaking out of their shells, or books set in historical China, or stories where nobody dies. And I know enough about the books in the library that I can usually match people up with something. That’s the beauty of knowing a little bit about readers advisory: while nothing is a substitute for actually reading the books, you can get pretty far if you know that that book with the cadeuceus on the cover is probably a medical thriller, and the one with the black and red cover and the bold print is probably more violent than the one with the ball of yarn by the fire, even if they are both shelved in the mystery section. I’ve always taken a similar approach to technology. It isn’t necessary for me, or for any given librarian, to know how to do a customized installation of MediaWiki or Drupal, or write a program, or provide IM reference service. What we do need to know is that there is technology out there and enough about said technology that we can identify what sort of technology might best fit our needs. My mother, who specializes in geriatric psychiatry, says that when medical students come through their psychiatry rotation, there are two things she wants them to know: 1) Geriatric psychiatry exists. 2) There are people who know more about it than I do. Knowing stuff exists and knowing how to find out more — and enjoying doing so — are, I would argue, the main things you need. Must like books. And computers. library camp of the west: join us in denver in october! Library Camp of the West will be held at the University of Denver on Friday, October 10 from 9 a.m. to 4 p.m.
You can more about how Steve and I have been tossing this idea around for a couple of years over on his blog. Until Steve had the good fortune to get to know Joe, this unconference was so unconferency that we didn’t even have a date or a place. Thanks to Joe, we now have both. Now we just need some attendees and some ideas. If you can come, sign yourself up on the wiki, and if you have an idea, add it there, too. If this sounds intriguing but you’re still in the dark about wikis, drop me a line at newrambler at gmail dot com. Library camps have traditionally been heavily focused on the technological parts of librarianship, but I don’t think they have to be. The idea of library camp is to get a bunch of smart library people together to share ideas — and maybe even get a barn and put on a show. I hope you can join us! Originally uploaded by Meeteetse Branch Library. In the year or so that I have been at the Meeteetse Branch Library, we have done a lot of good things. We’ve had summer reading programs for both kids and grown-ups. We’ve had authors visit. We’ve relabelled all the children’s books and almost all the adult fiction in order to get rid of the wretched Cutter numbers. We’ve acquired more books, movies, audio books, and CDs. We’ve had story times for preschoolers and book discussion groups for adults. We’ve had classes on digital photography. But nothing, I repeat, nothing has been anywhere near as successful or as popular as our current bulletin board. Yeah, you heard it: bulletin board. 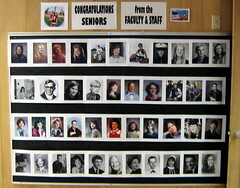 Every year the school does a bulletin board featuring pictures of the graduating seniors from various points in their lives. (There are 16 graduating seniors this year, which is a pretty big class for around here.) This year, we at the library thought it would be neat if we did a bulletin board featuring senior pictures from faculty and staff. We collected the pictures (many of them we got from old Meeteetse schools yearbooks that we have here in the library), scanned them and resized them so they were all the same height, and put them up on the bulletin board outside our door. They’ve been up for a couple of weeks now, and though traffic has died down somewhat, you still have to make your way through a crowd some times if you want to get from the library to the office. Eavesdropping around the bulletin board provides no end of entertainment: “Dude, Miss Linda was hot!” Kids stop by to look in between classes, as do teachers. Public library patrons (we’re a joint school/public library) often wander over to take a look, too. And everyone talks–about the hairstyles, about the clothes, about how much (or how little) everyone has changed. That’s the crux of it, I think: we have simultaneously changed enormously and not changed a bit. Some were born here; the rest of us arrived in Meeteetse through some hidden mechanism of decision or fate. It is rich and strange and quite wonderful. You should be able to pick me out without too much difficulty. Because most people are more timely bloggers than I am, and because I occupy a small corner of the ecosystem, I don’t expect anyone reading this in libraryland doesn’t already know that Walt Crawford got the boot from OCLC and is available for hire. Aside from his general laudableness (honest, that’s a word), Walt has distinguished himself to many of us through his collegiality and generosity. Distinguished and influential don’t always translate into accessible, but Walt has been a good friend and sparring partner to many of us not-so-luminous front-liners. . . . We owe him no less and wish him the best. Yeah. What she said. Good luck, Walt, with whatever comes next. Amazon plans to roll out DRM-free music later this year. Publishers Lunch wonders if DRM-free audio books can be far behind (sorry, no link for the story, which is in an e-mail newsletter from Publishers Marketplace–I highly recommend it though–the free version, which I get, is still full of fascinating publishing news). Librarians like me fondly wish for the day. My friend Felicia is awfully funny. She also takes beautiful photos. And now, I find, she’s been blogging for the SUNYLA 2007 Conference blog. If you’re going, check it out. I may be biased, but I think it’s a cut above the usual look-our-conference-must-be-cool-because-we-have-a-blog type conference blogs. Meredith notes that conference season has started. I myself am not going to any conferences this year, and thus I will not be able to harass engage in thoughtful discussion with any vendors. Just out of curiosity, have you ever considered establishing some kind of an online forum for NetLibrary/Recorded Books? Even in my tiny branch library, we have a number of patrons who have had difficulties with eAudiobooks that aren’t covered anywhere in the official FAQs. Sometimes I’m able to find the answer by fiddling around; sometimes I have luck by just searching the Web, since sometimes a blogger or someone else will have written about the problem. But going to that much work seems inefficient to me, especially since there are probably many other people having the same problem that I am at any given time. Wouldn’t it be great if there were a central location where we could ask questions and answer questions posed by other users? I think so. As you probably know, forums, message boards, and wikis are popular features of support for many kinds of software. My e-mail program, Fastmail, has them; WordPress, which I use for my blogs, has a great many. Firefox, Thunderbird, and their extensions have them; even Microsoft has some user forums. I think OCLC could do a great service for the library community by providing some kind of a forum for NetLibrary/Recorded Books. Doing so would allow librarians to do more easily what they already do best–collaborate and share information.